Warhammer: Shadow of the Horned Rat was one of the very first strategy games I ever played. One of the first in a long history that now stretches through the Command & Conquer series, Dawn of War, Company of Heroes, Homeworld, and all the others in between over nearly twenty years. Horned Rat was a strategy game set in Warhammer Fantasy and released on the original PlayStation and PC. It told the story of a mercenary general who leads his company of men through various battles which are tied together by a branching storyline. 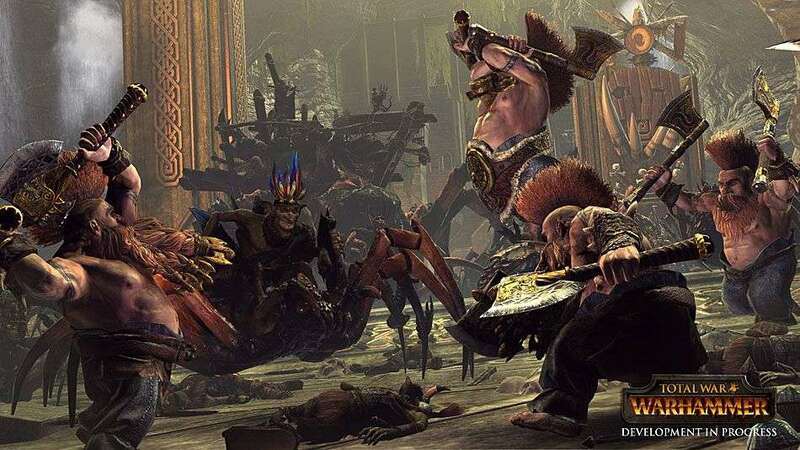 Ultimately, it’s fairly agreed that Shadow of the Horned Rat was a little broken and incredibly difficult, improved on greatly by its sequel Warhammer: Dark Omen. 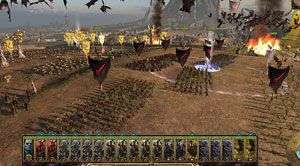 In any case I only bring this up because I’m fairly convinced that games like these were really the origin for the look and feel of the Total War games we are more familiar with today. And it’s the game that I would call the spiritual ancestor of Creative Assembly and SEGA’s latest release, Total War: Warhammer. 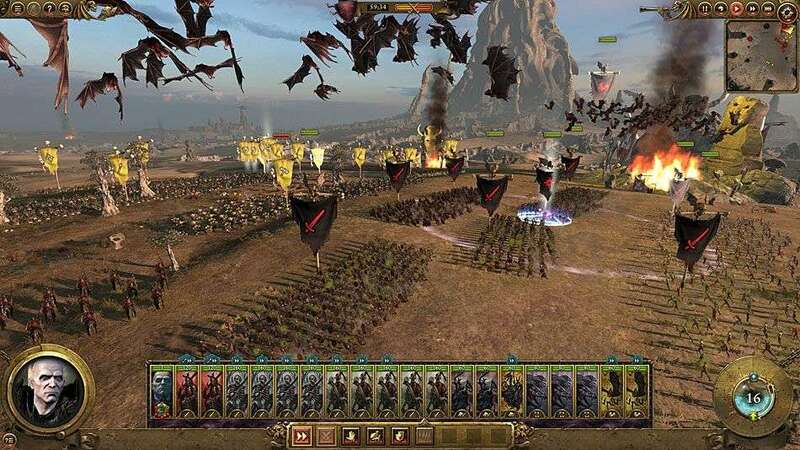 Warhammer is Creative Assembly’s first attempt at a grand strategy game in a fantasy setting where not only do you have to worry about the position of your archers on a hill, but that Pegasus-riding Celestial Wizard dropping meteors on your infantry. The Warhammer fantasy world is one you’re maybe not as familiar with as its sci-fi counterpart set in the 41stMillennium, but one constant remains – there is only war. 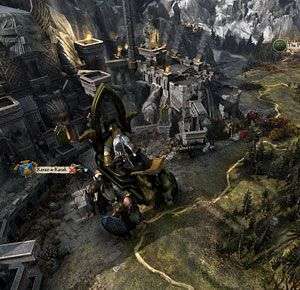 Total War: Warhammer focuses on the struggles of four (five if you have the pre-order Chaos expansion) of the famous Warhammer Fantasy races: the Empire of Man, the Dwarf Kingdoms, the Orcs and the Vampire Counts. Much of the action takes place on the campaign map, which beautifully replicates a large chunk of Warhammer (yeah that’s the name of the planet apparently). From the Dwarf holds in the World’s Edge Mountains to the turret-capped castles of Bretonnia, the map is brought to life by the incredible detail. Orc holds in the mountains are often accompanied by skulls carved in to the mountainside, while the lands of the Vampire Counts are dark and twisted by necromantic magic. The campaign map also shifts and changes based on the corruptions of the Vampire or Chaos forces. Corruption works much like religions did in the previous games – if a region becomes corrupted over time, your civilian population will become unhappy, eventually leading to rebellion and the rise of forces in the middle of your lands. This corruption is spread by enemy agents, who can move around your armies and park up, not stopping until removed by an agent of your own, such as the Captain. 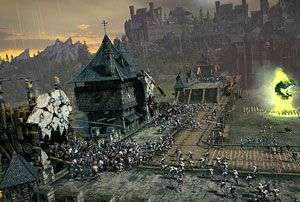 As with all previous Total War games, the key to survival is in the capture and control of the various towns and cities spread across the map. Building your army, constructing new buildings and spreading your influence in to new lands through combat or diplomacy is a staple of this type of game. Interestingly though, each race has their own set of unique objectives which gives your campaign a little bit of direction. The Empire, for example, has to unite the lands of the Empire under one banner to stand a better chance of surviving against enemies who literally encircle the lands. This is easier said than done, as not only do you have to contend with bringing the other human leaders on board (through diplomacy or, more likely, war), but you also need to protect yourself from the Vampire Counts, the raiding Dwarves or just roaming bands of Orcs and Goblins. There is also the addition of quest system where factions fight through set battles to unlock new items or units. Quests break up the ongoing campaign and set up incredibly cinematic battles, although in my opinion they are few and far between. In addition to these objectives, each race also has its own unique gameplay mechanic, which adds a layer of complexity to each. For example the blood-thirsty Orcs (not to be confused with the 40k Orks) have relatively cheap and large regiment numbers, but Orcs need a fight – they live for it – and they actually have their own “Fightiness” level. If Orcs don’t have a fight, or are losing wars, this level goes down and they begin to fight among themselves, losing troops to attrition as petty quarrels are settled. This means that as an Orc player you have to always be pushing forward towards the next big battle, eventually uniting the tribes and unleashing the WAAAAGH! Which leads nicely to the other side of the Total War coin, the war. 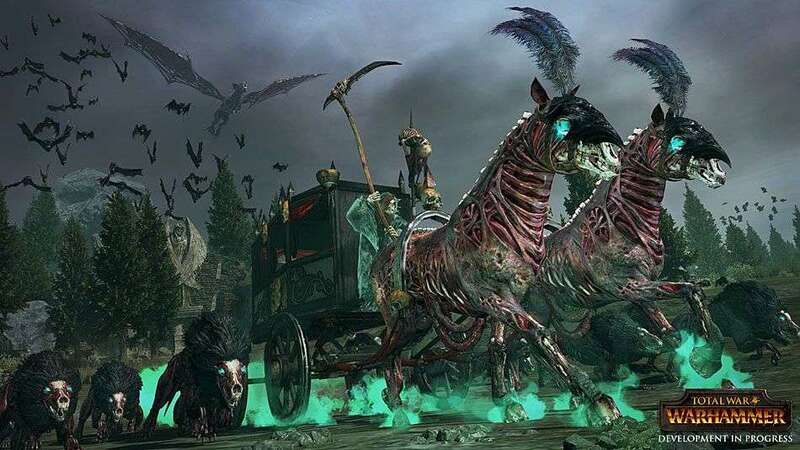 As I said, for nearly two decades Creative Assembly have really lead the way in regiment-style large-scale battles and that continues in Warhammer, only now my Pegasus riding wizard can shoot fireballs at the zombie army lead by a vampire. Where Warhammer really shines is in its variety of units. As you would expect from fantasy setting these range from your standard human swordsman to giants and wizards. The Empire has a focus on basic human units, spearmen and mounted knights, backed by a wide variety of agents, such as wizards and warrior priests. Dwarves are more technologically advanced, using a variety of war machines, such as the Gyrocopter, which flit around the battlefield dropping bombs on enemy units. If you have played a Total War game before then the combat system remains largely unchanged from Rome 2. Battles begin with a deployment phase, where units are positioned across the terrain, trying to find the best strategic position on the map. Units with the vanguard trait, such as the Empire’s outriders, can deploy much closer to the enemy, for those all-important surprise attacks. Each unit generally has a counter; giants can be stopped by heavy use of spearmen, spearmen can be countered by swordsmen or a cavalry charge to the rear. Most of the time however, the focus tends to be on destroying morale and causing the enemy to break. Players of the previous games will be familiar with the general’s ability to rally troops, or use various other abilities in combat, however the addition of magic adds a whole other level to this. Wizards become mobile artillery, healers and support units, moving between your ranks and often making a real difference. More than once I’ve survived near-impossible odds through effective use of the wizard’s abilities. The winds of magic are fickle however, and the amount of magical power you have will vary from battle to battle. 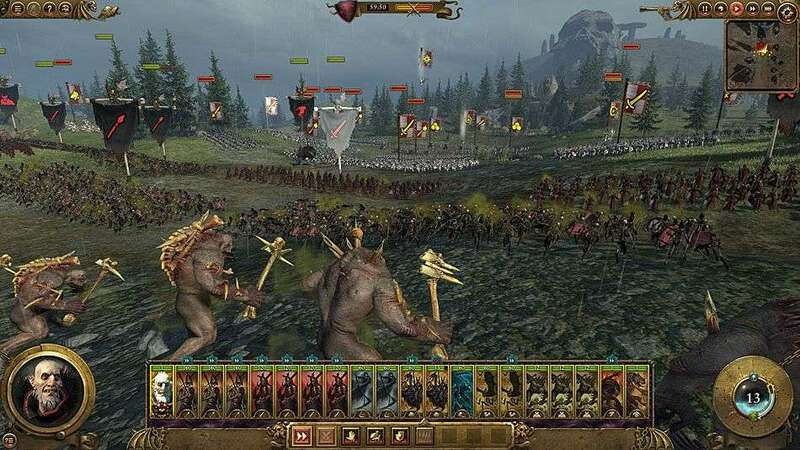 The addition of flying and monstrous units also add a layer to the standard battles of the Total War games. 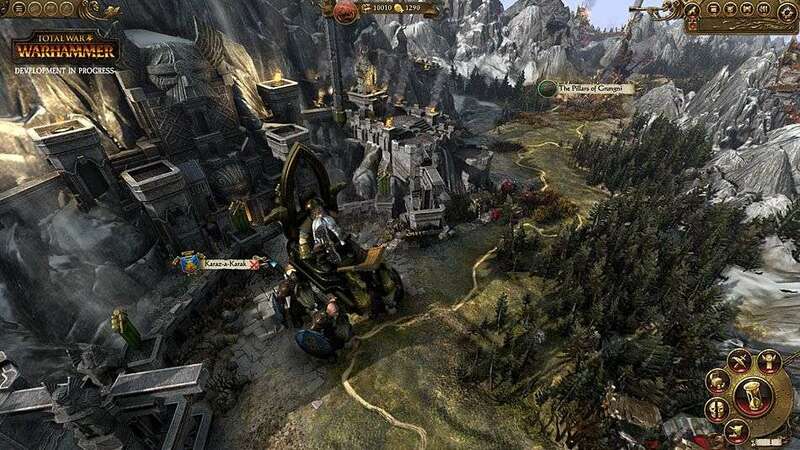 Typically a Total War game involves flanking, piling lines of troops in to others, managing artillery fire. However, when you drop a dragon in to the mix your strategies go out the window. Suddenly you’re not only watching your flanks, but ranged units become vitally important as they are the only way to bring a flying unit down. 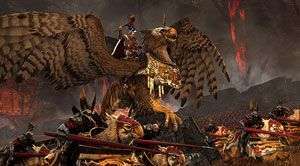 More than once I’ve used Karl Franz, the Emperor of the Empire, and his griffon mount to break difficult fights by dropping him from the air into the backs of enemy regiments, pulling him back and using him again to create a gap elsewhere. This freedom of movement creates whole new strategies, but also comes with the risk of having your hero boxed in or accidentally landing on your own men (which happens more than you’d think. A number of times now I’ve accidentally shot my men in the back with a wizard’s fireball or mortar round). This also changes that Total War classic, siege combat. They work much like they have in the previous games, defenders man the walls and try to keep attackers from central capture points throughout a city, while attackers attempt to breach the walls and gates through the use of towers, siege weapons or a ram. The addition of monstrous units changes things, as they can be used to breach gates and there is nothing quite as “fantasy” as a troll breaching a gate to stunned on lookers. Flying units also add to this, moving over walls to harass units with ease or take part in aerial battles. And the battles are beautiful. Creative Assembly have done a great job of improving the variety of character models, animations and effects (such as explosions and spells). I want to say that these additions are noticeable but, for me, the majority of time is spent a few miles away from the action, where I can see an overview of the battle and how units are moving. Very rarely do you get the chance to swoop in and take in the action unless you’re one of those players who pause, and you don’t want to be one of those people. Along with the various faction campaigns, the game comes a host of set battles which seem to follow the various faction-specific quests and are pulled from the vast lore. 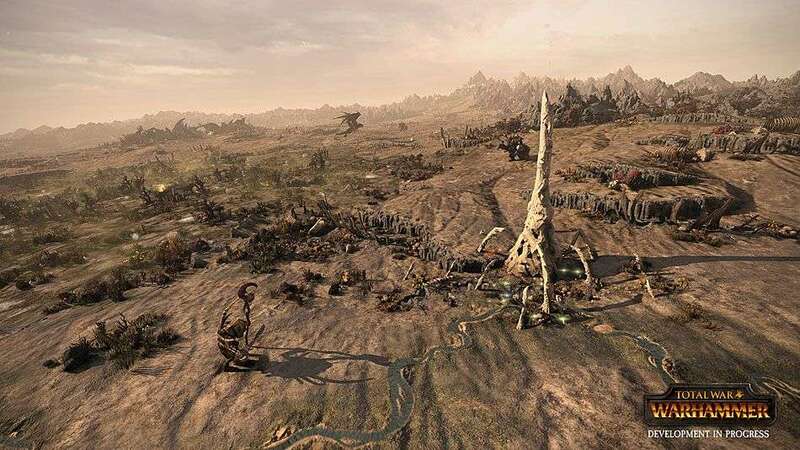 You also have the option to set up custom battles, which work as they have done for a number of Total War games, selecting a map to fight on, the factions that will fight, and building an army using a set budget. It’s a great way to try out the higher level units before buying them in the campaign. Despite this the game is not without its issues, for example I feel that the difficulty level isn’t quite right, although I know that’s subjective. Battles work well, like I said you can change the course of a fight where you are heavily outnumbered by using agents, magic and a little strategy. However, the AI on player factions always seems to be overly aggressive and the diplomacy system is pretty worthless. This is understandable in some ways, it is a game about war, but pulling together allies is always a struggle. Hero units also seem to be insanely powerful and difficult to kill outright. I know why this decision was made, you don’t want the Emperor to go down in a couple of hits, but even standard generals take a good amount of hammering before falling. 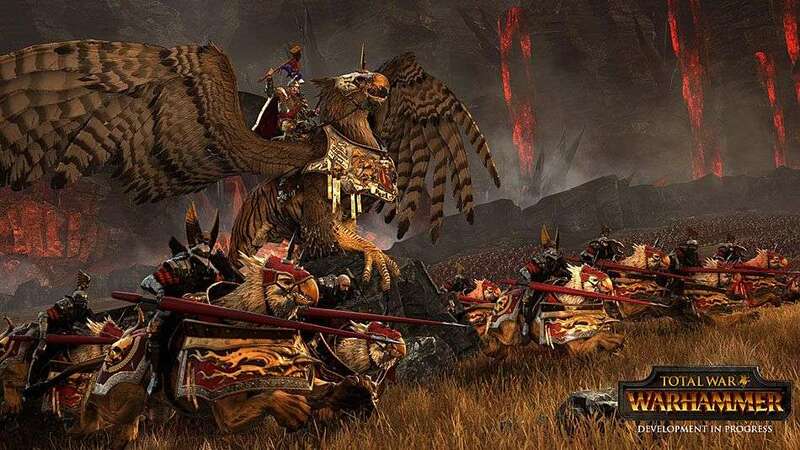 Generally though Total War: Warhammer is a great addition to the Total War franchise, pulling in the best parts of the previous titles and introduces layers of depth through the use of magic, monstrous and flying units, presented in a beautiful fantasy setting. It’s a must have for fans of the tabletop game. Did that dragon just eat that guy? I love this game. 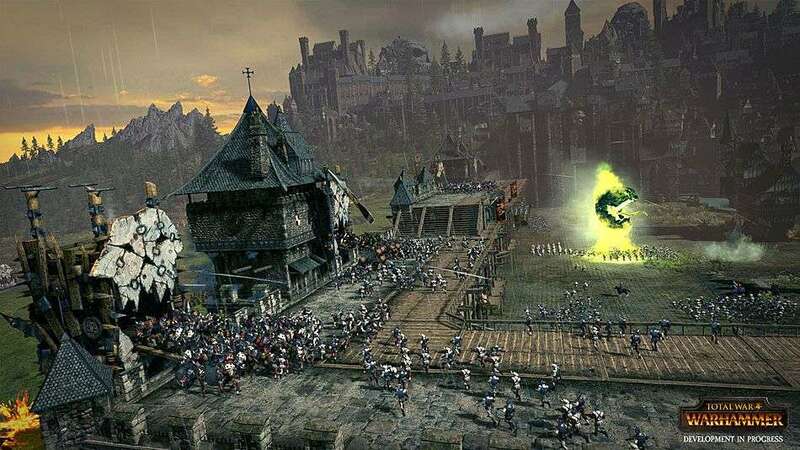 I love it because for all the years I’ve been playing Total War games I always wished I could use a giant to knock down a city gate, or shoot a fireball at those enemies attacking my walls. I hadn’t had that feeling since games like Shadow of the Horned Rat or Mark of Chaos, both of which did an okay job of portraying the epic fantasy battles that played out in my head when I played the tabletop, but rarely hit the mark. 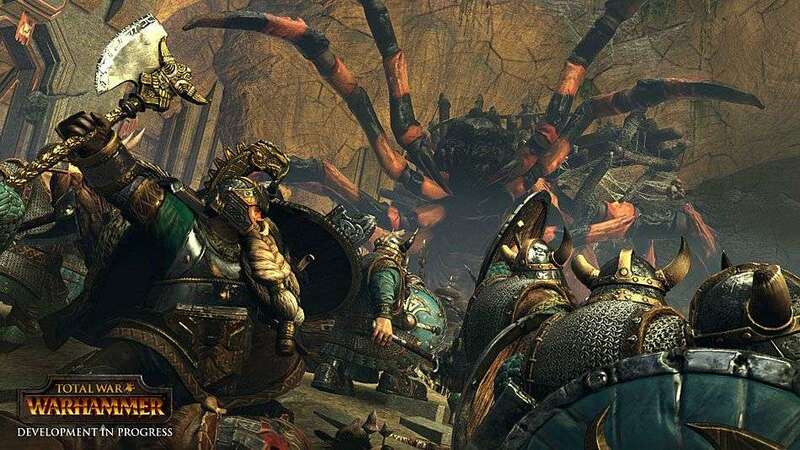 What Creative Assembly have done is finally build the game that fans have been waiting for. I’m excited to see what they do next with this, the addition of the other races, the High Elves and Dark Elves, the Beastmen or Skaven - there is so much more they can do. It’s a brutal title that will test the limits of your strategy and patience at times, but also lets you charge ranks of Orcs with a magical hammer wielding emperor, who is also riding a griffon. I’m not sure you can get that anywhere else.